All flagship models represent what’s best and most interesting about their maker at the moment, but Beneteau somehow always manages to pack their flagship yachts with just a bit more than the competition. The French builder launched their latest flagship motor yacht, the classically designed 50 Gran Turismo (available as Hard Top and Sport Fly) in Cannes last year, and we got a chance to test it recently, in Split. The unit we tested was a 50 Gran Turismo Sport Fly, a classy motor yacht with a black and white hull and black superstructure details. The little French gem has a hydraulic submersible transom with 350 kg capacity, large enough for a jet ski, which leaves the aft garage free to host a tender up to 2,90 meters. The garage door opens vertically, and the garage also has a foldable ramp and an electric winch to facilitate lifting and lowering of the tender. The main deck is designed around the idea of conviviality, with interiors connected to the cockpit. The cockpit itself is furnished with an L-shaped sofa and a foldable table that doubles as a sun pad, while the sofa in the salon stretches all the way to the cockpit, and is also served by a foldable table. Right next to the entrance into the salon, under the fly bridge staircase, there’s a small kitchen element with a sink and a fridge. Up on the fly bridge, there’s another sofa, a foldable table that seats four, a sofa with sun pads port, and the command console starboard on the bow. The main deck salon is light and airy, surrounded by glazed surfaces whose bottom part can be opened electronically. 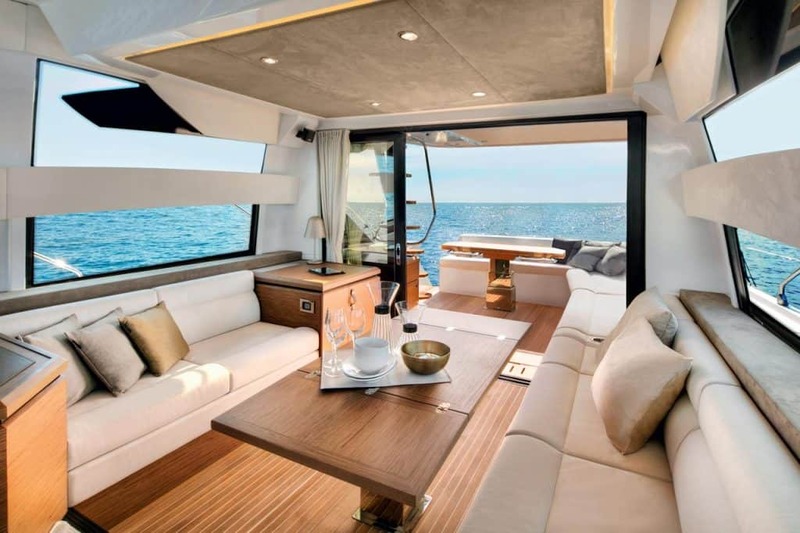 The interior is relaxing, breezy, with lots of wenge wood, beige leather and light beige fabrics, as well as several luxury decorative accents. Decoration and furnishing are customizable, as usually is the case with Beneteau models. The command post is built around the touchscreen of the Simrad system: 50 Gran Turismo is the first Beneteau yacht with the Ship Control display that controls every system. The unit we tested had two displays, one for the skipper and one for the co-pilot, but the system can be installed on any tablet, allowing for control from almost anywhere aboard. Next to the command post, on the left side, are the staircase leading below deck, and the galley, furnished in glossy gray lacquered wood, with a large fridge, stove, sink, microwave and dishwasher (optional). 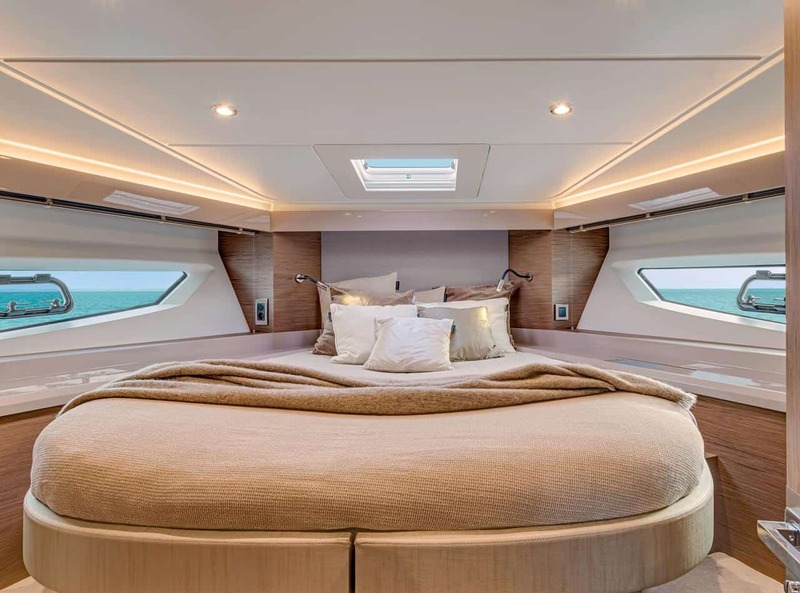 The VIP cabin in the bow has a double bed that be split into two beds and shares the head with the double guest cabin (alternatively, the skipper’s cabin). The owner’s suite is very large and very comfortable; it has a double bed and two sofas (in front of the windows) that can easily be turned into beds for children. The cabin is served by a private head set on a raised platform to allow maximum space usage and separation of the shower cabin and the toilet. 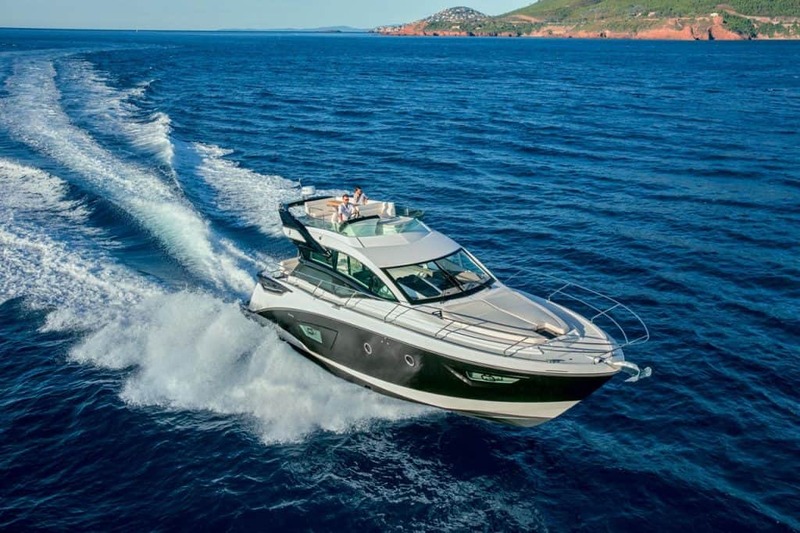 Beneteau 50 Gran Turismo was not designed for excessive speed – top speed does not exceed 28 knots – but it is still fast enough and uses fuel prudently. Anywhere between 17 and 24 knots, the yacht uses between 100 and 150 liters of fuel per hour. Comfortable and stylish, Beneteau 50 Gran Turismo Sport Fly is a cozy family cruiser and an excellent choice for buyers looking for a versatile motor yacht with lots of space on both decks deck and in the interior.